No handicap on score card - Disqualification! In an earlier blog I covered the subject; 'Is it a One Sroke Penalty or Two Strokes?' Just as important, are the circumstances in which a player can be disqualified, the penalty for the most serious breaches of the Rules. Note that in match play, disqualification may apply either to the hole being played or to the match itself. Not playing holes in the correct order (Rule 1-1 – stroke play only). Deliberately influencing the position or the movement of a ball (Rule 1-2). Deliberately deflecting or stopping a ball (Rule 1-2). Agreement to waive any Rule or penalty (Rule 1-3). Playing from the next tee without holing out on the previous green (Rule 3-2 – stroke play only). Playing a second ball and not subsequently reporting the facts to the Committee (Rule 3-3). Refusing to comply with a Rule affecting the rights of another competitor (Rule 3-4). Making a stroke with a non-conforming club (Rule 4-1). Deliberately changing the playing characteristics of a club during a stipulated round (Rule 4-2). Applying ‘foreign material’ to the face of a club (Rule 4-2). Playing with a club that has been rendered non-conforming by damage other than in the normal course of play (Rule 4-3b & c). Failure to declare excess club (i.e. more than 14) out of play immediately upon discovery, or using an excess club after the declaration during the remainder of the stipulated round (Rule 4-4). Using a non-conforming ball (Rule 5-1). Applying ‘foreign material’ to a ball (Rule 5-2). Declaring (match play) or recording (stroke play) a higher handicap than entitled to (Rule 6-2). Failure to record handicap on scorecard (Rule 6-2 - stroke play only). Failure to start at the time established by the Committee (Rule 6-3). (Amended 1st Jan 2012 to more than 5 minutes late). Failing to ensure that no more than one caddie is used at any one time, after being penalised for a breach of this Rule, during the remainder of the stipulated round (6-4). Failing to sign a score card (Rule 6-6). Signing an incomplete or incorrect score card (Rule 6-6). Unduly delaying play subsequent to receiving a penalty for the same offence from the Committee (Rule 6-7). Discontinuing play without Committee approval (Rule 6-8). Agreeing to play out of turn in order to gain an advantage (Rule 10.2c – stroke play only). Using a non-conforming tee (Rule 11-1). Deliberately moving the tee-markers because the player feels that they are too close together, too far back, aimed in the wrong direction or some similar reason and not replacing them before anyone makes their stroke (Decision 11-2/2b). Playing from outside the teeing ground and not subsequently correcting the error (Rule 11-4). Using an artificial device or unusual equipment (Rule 14-3). Playing a wrong ball and not subsequently correcting the error (Rule 15-3 – stroke play only). Playing from the wrong place and not subsequently correcting the error (Rule 20-7 – stroke play only). Agreeing not to lift a ball that might assist any other player (Rule 22-1 – stroke play only). Playing out of turn in foursomes (or threesomes) and not subsequently correcting the error (Rule 29-3). Not identifying which partner’s gross score is to count in four-ball stroke play (Rule 31-3). Committing a breach of etiquette that the Committee considers serious (Rule 33-7). Two years ago, I combined with Andy Brown of GolfSwingSecretsRevealed.com to produce an audio CD, ‘99 Golden Nuggets to Demystifying the Rules of Golf’. Andy has made the first chapter of this CD, ‘Before Commencing a Round’ available as a free MP3 format audio file. Click here for details on how to download his gift. You can find out much more about the contents of ’99 Golden Nuggets to Demystifying the Rules of Golf’ including some glowing testimonials from users at this link. Last year at my club we had a 36 hole foursomes competition. My playing partner and I participated in the event and were required to submit our scorecard in after completion of the first 18 holes. It was a shotgun start for the field and as we passed the clubhouse we handed our card in for the first 18. On completion of the 2nd 18 we returned to the clubhouse for drinks and presentations with most groups finishing about the same time. Soon after we ( my playing partner and myself) were advised by one of the organisers that we have been disqualified for having not put our handicaps onto the scorecard for the 2nd 18 holes played. This was a rude shock to me and I considered it a bit mean and felt hard done by here. Do you happen to have a view on this please Barry? In any round of a handicap competition, the competitor must ensure that his handicap is recorded on his score card before it is returned to the Committee. As there were two rounds for the foursomes competition the handicaps must be recorded on both score cards. I want to pick at the semantics of this on this occaision. If the term had been "In every round" or "In all rounds" then this is clear cut - must do. But the term "In any round" I interperet in this instance to be at least once in any one of the round(s) ( whether it be a single or multiple round competition). Do you concur with my interpretation? No, I interpret Rule 6-6 differently. If there are 4 rounds in a competition there are four cards to return. If the player does not sign their card in any of those four rounds they incur the penalty of disqualification. Just think of the problems that a Committee would face if there were 100 competitors over four rounds and many players only entered their handicap on their first round score card. I was playing a stroke play tournament and my ball went OB I hit a provisional (also OB) and found my first and played it as a lateral hazard out of instinct (moved the ball two club lengths from the OB and dropped) I finished the hole fine. I now realize I made a mistake and should be penalized. What is the correct course of action? Disqualification or 2 strokes? I did not sign my score card until reviewing with the officials, which was when they said I was disqualified. Yes, the Committee had no option but to disqualify you. The only way that you could complete the stipulated round in a strokes competition was to return to the tee for your 5th stroke. The fact that you played from a wrong place and did not correct the mistake before teeing-off at the next teeing ground incurred the penalty of disqualification. Rules 27-1b, 20-5 and 20-7c. Someone in an 18 hole stroke play played 6 under their handicap but did not sign the book before play and was therefore disqualified. They then thought they would go up .1 but they were cut. They thought this was incorrect. What is your take on this? This is really a question on handicap systems, which I am not an expert on. However, in my opinion, if the player was not entered in the competition (the transgression that he was disqualified for) his score card should not have been taken into account for handicapping purposes. However, I stress that there are many different handicapping systems around the world and some may have policies that do not concur with this opinion. I played in a compettition at the weekend and shot net 67. Put my card in the box and realised it wasnt signed. I asked the club if i could have the key to the box to get my card out, they said no this was strictly forbidden is this correct? Q.Rule 6-6c prohibits alterations to the score card "after the competitor has returned it to the Committee." When is a score card considered returned? A. This is a matter for the Committee to decide and it will vary depending on the nature of the competition. The Committee should designate a "scoring area" where competitors are to return their score cards (e.g., in a tent, a trailer, the golf shop, by the scoreboard, etc.). When it has done so, Rule 6-6c should be interpreted in such a way that a competitor within the "scoring area" is considered to be in the process of returning his score card. Alterations may be made on the score card even if the competitor has handed the score card to a member of the Committee. 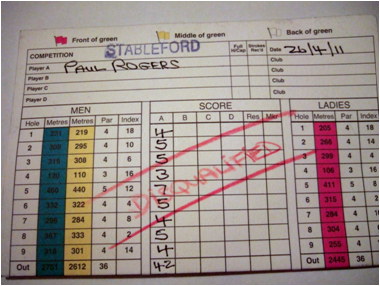 He is considered to have returned his score card when he has left the scoring area. Alternatively, the Committee may require a competitor to return his score card by placing it in a box and thus consider it returned when it is dropped into the box, even if he has not left the scoring area. Your list is great, especially as I have an exam coming up. playing holes in correct order. I agree with the decision, but could you explain your reasoning. Decision 1-1/1: Q. Two players on the 8th hole play their approach shots to the 8th green. They agree to tee off at the 9th hole and then putt out on the 8th green. This is to avoid having to walk back up a hill to the 9th tee and to save time. What is the ruling? A. In match play, the players are disqualified under Rule 1-3 for excluding the operation of Rule 2-1 by failing to play the stipulated round. In stroke play, the competitors are disqualified under Rule 3-2 for failing to hole out on the 8th hole before making a stroke from the 9th tee. In a stableford tournament, a competitor scores a 5 on a par 4 - his marker marks it as 4. the competitor asks him to correct the score which he does. They submit their cards at the end of the round and leave for the main clubhouse. Later on the competitor finds that he has been disqualified, he reason given being the score recorded on that particular hole was ilegible. Now, when the competitor had submitted his card, there was neither anyone from the committee nor a representative to accept his card or offer him a chance to clarify his card. Morever, the competitor had also marked his stableford score for the hole correctly. Can the committee disqualify him citing 'illegible score' in one hole for this? The direct answer to your question is, "Yes the Committee can disqualify the player, as their decision is final", Rule 34-3. No doubt they will say that the competitor should have checked that his card was legible before signing it and returning it to them. However, I believe that most Committees would make an effort to check the score for the hole before taking the disqualification route. For example, comparing the score with the points recorded (if they were calculated on the score card), comparing with any other place that the score was entered (e.g. a computer system), contacting the marker (who also had to sign the card) to decipher his hand writing, or contacting another fellow competitor that was playing in the same group for his recollection of the player's score on the hole. Unfortunately, the disqualification penalty cannot be rescinded after the competition has closed, but that does not stop the Committee from making amends. I have just been disqualified from TWO competions, where I would have won a prize, for not having my handicap on the scorecard. It was dissapointing, and was due to my lack of knowledge of the rules. However, it does seem harsh given we have computer entry for all competitions, where you enter your ID and confirm your name and handicap, and again confirm your score at the end of play, also confirming name and handicap. I assumed that I had done what I needed to do? It seems to me that there should be a reminder in these scoring systems to check for scorecard completion on top of computer confirmation? Computer systems play no part in the Rules of Golf for an obvious reason. They are probably not used in a majority of golf competitions throughout the world. The Rules of Golf are exactly the same in whichever country the game is played. Rule 6-1 states that players are responsible for knowing the Rules and Rule 6-2b states that players must ensure that their handicap is recorded on their score card before it is returned to the Committee. There are positives resulting from this episode. You will probably never again return a score card without your signature and handicap entered on it and others may also have learned from your misfortune. Please keep reading this blog for other useful information on protecting your scores by having a better understanding of the Rules. Hi, the first on your list of reasons for disqualifications is not playing the holes in the correct order (Stroke Play) Rule 1-1. I can't find that mentioned under Rule 1-1 and if it is correct, why doesn't it apply to shot gun starts. Roberto DiVensenzo sp? signed for a score which was higher than the actual one and there was no disqualification. Q.Two players on the 8th hole play their approach shots to the 8th green. They agree to tee off at the 9th hole and then putt out on the 8th green. This is to avoid having to walk back up a hill to the 9th tee and to save time. What is the ruling? A.In match play, the players are disqualified under Rule 1-3 for excluding the operation of Rule 2-1 by failing to play the stipulated round. The “stipulated round’’ consists of playing the holes of the course in their correct sequence, unless otherwise authorized by the Committee. When a player and their marker sign, a score card containing a score for a hole that is higher than was actually scored that is the score that stands. In the eyes of the Committee it is not an 'incorrect' score. The penalty only applies if the player returns a score card with a lower score than was actually scored. The “stipulated round’’ consists of playing the holes of the course in their correct sequence, unless otherwise authorized by the Committee. The number of holes in a stipulated round is 18 unless a smaller number is authorized by the Committee. Players must not agree to exclude the operation of any Rule or to waive any penalty incurred. Stroke play – Disqualification of competitors concerned. It does not matter that it was a Stableford competition, as the players are disqualified from the competition and not just the hole. We had a group decide that they wanted to be at the front of the field for a shotgun start and so teed off the 8th tee, instead of their assigned 5th tee. Even though they played the holes in correct numerical order, they did not begin their round at the tee the committee had assigned to them. Are they disqualified? Although shotgun starts are not covered in the Rules of Golf I have no doubt that these players should have been disqualified. First, they were not on the tee they were allocated at their starting time (Rule 6-3); second they played from the wrong teeing ground (Rule 11-4); and third they did not play the stipulated round, as required by the Committee (Rule 3-1). Question. Can I play the holes on a course in random order and still submit my score for handicap purposes? Example. If the players in front of me are too slow, and I want to skip certain holes, and go back to them later, thus, trying to play my round at a better pace, is this round still valid for my handicap? All rules are still being followed. I'm just simply playing the 18 holes not in the correct order of the club. Thanks. Unlike the Rules of Golf, handicapping systems vary all over the world and I don't pretend to be an expert on them. However, I would be very surprised if any handicapping authority would permit a score to count for handicapping purposes unless it was a stipulated round. Part of the Definition of Stipulated Round states that it consists of playing the holes of the course in their correct sequence, unless otherwise authorised by the Committee. After a match play round was concluded,the scorecard was turned in showing 10-3. The real score was 9-4. Is there any impact on the outcome? There is no requirement to keep a score card in match play. The match is won when one side leads by a number of holes greater than the number of remaining holes (Rule 2-3). Neither 10-3 or 9-4 is a valid result in match play. If one side had won 9 holes and the other had won 4 holes the result could have been 5 and 4 (i.e. 5 holes up and only 4 holes remaining.) If all 18 holes were played (i.e. 5 holes were halved) the match was won at some earlier point and the remaining holes were inconsequential. Is there any rule about notification of disqualifacation? We were told we were leading a competition but when results were published we were not on board. When I asked how we did as I knew our score was higher than the winning score I was told we were disqualified as I player played off wrOng handicap. No there is no Rule that a Committee must notify a competitor about their disqualification, prior or subsequent to announcing the result of the competition, though in my opinion it is a basic courtesy to do so. Where there are prizes for gross scores in a competition would a competitor be disqualified from the gross score prize if he failed to put his handicap on the score card? If no handicap is recorded on his score card before it is returned (Rule 6-6b), or if the recorded handicap is higher than that to which he is entitled and this affects the number of strokes received, he is disqualified from the handicap competition; otherwise, the score stands. So, in gross competitions, which are not handicap competitions, a player is not disqualified for not entering a handicap on their score card. Because it was a Stableford competition you were disqualified for any hole that you did not play out from the correct teeing grounds (i.e. you scored no points on those holes). You should not have been disqualified from the whole competition, Rule 32-2. I was playing in a friendly ladies competition at my club, i was not doing our teams scorecard so i did not notice this mistake: my partners did not write our handicap on our scorecard, but my question is was it our fault or is it the fault of the organizers. We were then disqualified from the competition, is this a bit extreme as it was only a friendly stableford competition??? In stroke play the competitor must ensure that their handicap is recorded on their score card before returning it at the end of their round. If no handicap is recorded on their card before it is returned, they are disqualified, Rule 6-6b. The Rules of Golf are the same in a friendly Stableford competition as in any other! We have a computer at the golf course, and competitors normally enter the competition through the computer. I am of the understanding that currently, the Rules of Golf consider the computer a 'courtesy', and that as long as you indicate your intention of entering the competition in some way, prior to going out to play, you cannot be disqualified if you have not entered your intention specifically in the computer, or, having entered in the computer, being disqualified if you return your correctly marked and signed card, but not enter your score in the computer. Our club has indicated that competitors must enter through the computer, and will be disqualified if they do not enter the competition and return their cards in that manner. I believe that this is covered in the Rules of Golf (Dec. 6-6/b), but would like confirmation of whether I am interpreting this correctly or not. The Committee may certainly make it a Condition that competitors must enter a competition through a computer system. Anyone who does not comply has therefore not met with the requirements of entry and their score card cannot be counted. I think that you are confusing the situation with Decision 6-6b/8, which rules that Committees may not make a Condition of Competition that requires a competitor to enter their score into a computer after their round. WE HAVE JUST HAD A FOUR BALL BETTER BALL COMPETITION WHERE THE MARKER FAILED TO FILL IN pLAYER A OR PLAYER B ON THE SCORE CARD SO THE SCORE WAS ALL ON ONE LINE,SO YOU COULD NOT SEE WHICH PLAYER HAD RECORDED THE SCORE.ALL THE SCORES WERE CORRECT BUT COULD NOT BE CHECKED AS FAR AS THE DIFFERANT HANDICAPS WERE CONCERNED. The players were alerted to this prior to entering the score in the computer and worked back through the card and all resigned the amended card.Are they allowed to do this? Hi Barry. Great insight on the rules of golf. In matchplay if the team sheets have been swapped over and a player subsequently realises their handicap is wrong. In this case the players handicap had gone out rather than down and it didn't change the order in which the team went out. What is the position in this case? This situation is not covered by the Rules of Golf. However, there may be a Condition of Competition that rules on team lists; if not, then the Committee organising the competition should make the decision. In my opinion, in the circumstances that you describe, the player should be permitted to play off the lower handicap that was wrongly declared on the team sheet. The decision is more difficult in a situation where a higher handicap has been declared, but depending on how the error was discovered, I would probably permit the player to play their match of their correct, lower handicap for the sake of continuing good relations between the teams. At the end of a comp, a player asked his playing partner to hand his card in. The card was handed over to the days official scorer, albeit not in the scorers office. The scorer noticed the player had not signed his card and gave it back saying "go and get the card signed" Is this correct or should the player have been disqualified? The player should not have been disqualified. Decision 6-6c/1 shows us that alterations may be made on the score card even if the competitor has handed the score card to a member of the Committee. A player is considered to have returned his score card when he has left the scoring area. No, the card had not been 'returned', as it was not accepted by the official scorer, due to the lack of signature. In the same way that officials (and fellow competitors) are encouraged to prevent breaches of the Rules before they happen, Committee members are encouraged to ensure that score cards are properly completed before they are returned. No, the Rules only require that the player's name, their full handicap and the gross scores for each hole are recorded on the signed score card when it is returned at the end of the round. It does not matter where the handicap is written, providing it is obvious that it is the player's handicap, though obviously it is more convenient for the Committee if it is entered in the area provided on the score card. In a match play competition, Player A mistakenly plays the wrong ball on a hole. He notices his error and notifies his opponent. They both believe he has incurred a two stroke penalty (as opposed to the loss of hole penalty he should have incurred). A then replays the shot and records a 6 including the two stroke penalty on his scorecard. His opponent also scores a six and the players believe the hole is halved. The round concludes with A winning the match 3&1. They sign the card and turn it into the scorer. Should A and/or B be disqualified for signing the incorrect total score (3&1)? Is A's score of 6 on the hole considered lower than his actual score - which disqualifies him from the match? Finally, both A and B notified the committee, in passing, of the penalty incurred by A and their treatment of the situation. Neither player asked for a ruling because both believed a two stroke penalty was the correct assessment. They were merely recounting how unusual it was that A could incur the penalty and still halve the hole. The committee did not notice the error at the time. Would this have any affect on the questions above? Thanks for your help - I'm totally stumped on this one. The result of the match stands. In match play, it is too late to make any claim concerning penalties incurred once a player has made a stroke at the following hole (Rule 2-5). Unfortunately, you are still confusing stroke play Rules with match play. There are many differences and I refer you to my blog dated 27th March 2013. For example, players cannot be disqualified from a match play competition for signing for an incorrect score, as the Rules do not require a score card to be kept. It is up to the sides to agree on the score as they proceed through the match. The Committee should certainly have been able to immediately confirm that the match result stands. Players (and Committees) are responsible for knowing the Rules (Rule 6-1) and the player that should have won the hole, as soon as their opponent played a wrong ball, should have known this. Yes, the player should be disqualified for a breach of Rule 6-6a, as the gross score for each hole must be recorded on the score card. The player is responsible for returning a signed score card with all the gross score correctly recorded on that card. A guy at my club played in a competition with another member, they both marked their own cards and just signed each others cards at the end of the round. Neither took a note of the other member's score. Is it essential to switch cards at the start of a round? Should they be Disqualified? After each hole the marker should check the score with the competitor and record it. In my opinion, the Committee should definitely interview the players and require that they follow the recommendation of the Rule in future competitions. In relation to the blog relating to skipping holes in a Stabelford resulting in disqualification, can you explain how the wording in the Decisions on the Rules 32.1/2 is applied? Does this not allow you to skip a hole? I suspect you know that this question has been the subject of much discussion recently. A reply has now been received from a representative of the Ruling Bodies confirming that a player is not DQ’d for missing/omitting or not returning a score for holes in a Stableford competition. The nature of Stableford is that it is permitted to omit holes. Decision 32-1/2 supports this. Love your web-site. I am querying rule 8-6. A person who fails to enter a qualifying competition in the required manner is deemed to have neither a score for the competition or a score for handicap purposes. This is not a Rules of Golf query (there is no Rule 8-6) and I do not profess to have any knowledge of handicapping systems, which vary greatly around the world. However, as a fellow golfer it seems to me that if you played a round of golf with fellow competitors entered in a competition, the Committee acted reasonably. My partner &I DQ from a Winter s/ford comp last year (comp played over 6mth-one card submit per mth - best of 4) because I allowed my partner to complete 1 score card and she didnt incl date. book was signed. I accepted decision, the spirit of comp.My own resp-should have checked. the same player submit wrong date this year but they didn't disq. Comm rule players fill in own cards. under 33.5 Is this fair? This would be a reasonable Condition of Competition for a competition that is played over several months. If this was the case for the competition that you had entered, the Committee would have been justified in disqualifying you for not entering a date, though in my opinion it would not have been be reasonable, as it seems that you had signed the entry book showing that you played on that day. Obviously, I do not know why the Committee subsequently accepted a score card that did not have a date; perhaps that was for a competition that was only played over one day, which would be reasonable. If a player enters the names of themselves and their partner and gets the handicaps the wrong way round ie player A has player Bs handicap on the entry sheet, doesnt correct it before play but corrects it after they have finished their round, is this allowed? The Rules of Golf only require that the signed score card that is returned to the Committee when the round has been completed has the players' correct handicaps. So, your score should stand. In match play, once the match is over some players continue playing the balance holes and have a sudden loss of form and start scoring triple bogeys thereby disguising their tournament scores. Are there some rules regarding this? How can this be stopped. Unlike the Rules of Golf, which are unified across the world, handicapping systems vary considerably and I have no expertise in this area. In fact, in UK and Ireland, where I play my golf, match play scores are not taken into consideration for handicaps. My only advice is to take your complaint to the Committee, who should then decide whether the players are protecting their handicaps and if so, what action is appropriate. This is not a black and white situation. Rule 5-3 states that players must start at the time established by the Committee. If the Committee had passed a Condition of Competition that players should agree their own time to play a match then your opponent should be disqualified for not being on the first tee within 5 minutes of that agreed time. However, if the Pro was a representative of the Committee then your opponent could claim that the original timing could not stand as he was instructed to play at a different time. The Committee's ruling is final. Hi Barry - I would like to get your thoughts on the following scenario pls. In a stroke play competition, a player hands in his scorecard with all the scores correct, incl. the name, date, total score, signature, etc. The Committee on tallying up the score then identify that the marker put his scores in the player column whilst the player's scores were inserted in the markers column. What would the outcome be in this scenario pls? Would rule 6-6/4 d apply (and the Committee simply switch the names at the top of the column) or would rule 6-6c apply and the player then be DQ'd for inserting an incorrect gross score on a hole. Your clarification is kindly requested. Although there is no Decision on the specific circumstances that you describe, in my opinion, Decision 6-6d/4 indicates that the Committee should accept the score card, as all the requirements of the Rules were met, it was only the column headings on the correct score that were wrong. Regarding your follow-up question, Decision 6-6d/4 is a singles stroke play scenario, not a four-ball. I was entered in a Flag competition on Sunday (play the par for the course plus you handicap shots to see how far you get around the course). After 18 holes I had shots left so started again at the first. I won the competition, was awarded the prize and retired home with a smile. However, when I finished the 18th I signed the card I was marking and handed it to the player, but he handed my card to the Club Captain who was going to continue with me on the 1st. The club captain then handed my card to the starter on the first and I never saw it again. On Monday I was DQ'd from the competition for not signing the card. But what was I disqualified from? The committee had decided that in addition to the Flag competition there would be a medal played as well so all cards needed to be returned. Is the committee within their rights or has something gone awry here. I should add that the committee required all the cards to be taken into the club house rather than be placed in the box, despite declaring that a medal was being played in parallel with the flag competition. At the end of the day I accept my error, but something squiffy was happening here that I feel the committee should be addressing. I am having difficulty in understanding the circumstances that you have described, as I have never heard of the Flag format; it is certainly not recognised in the Rules of Golf. I can tell you that the disqualification penalty applies to any competition where your gross score for any hole was not entered and attested by both you and your marker. I can also confirm that the Committee's decision is final. I can only suggest that you ask the Committee to fully explain to you the reasoning behind their ruling. Hi Barry, thanks for the reply, but I think I have resolved the dilemma. Rule 34.1 b covers the situation precisely. In stroke play if the player was unaware that they had not signed their card and the competition is closed then the committee should not dq them. However, I agree, if they decide too then their decision must be accepted. I think that you are misinterpreting Rule 34-1b, which only states that in stroke play, a penalty must not be rescinded, modified or imposed after the competition has close, with certain exceptions relating to when a player may be subsequently disqualified. It is Rule 6-6b that is relevant to your circumstances. Anyway, good luck with your 'appeal' to the Committee. Hi Barry, referring to the FAQs on 34-1 this matter is addressed directly; FAQ 1. FAQ 2 refers to when the result of the competition is officially announced. Award of the prizes is given as an example of what might constitute officially announcing the competition as closed. Quick question. I was given a time to go out with 3 others in today's men's comp, they decided to go out 50 minutes early without me leaving me with no game due to all being four balls and without notifying me. Should they have been disqualified? Yes, they should have been disqualified under Rule 6-3. In my opinion, the Committee should also sanction them from at least one future competition for this unacceptable behaviour. We are running a tournament next week: Nassau 4-ball/best ball match. Since this is essentially 3 matches the teams starting midway on the back seem to be at a disadvantage since they won't know their standing until they get through the course front nine, plus they're having to split one of their 3 matches. Our committee thinks it would be more fair to score the Nassau first nine played from the starting hole. So if they start at #15, their front nine ends at #5. I think this might put them in a better mind set knowing they are either ahead or behind after 9 holes. But one of the Clubs in the tournament insists this is totally wrong and we must score the Nassau using the course front nine and course back nine. We'll do whatever is right and conventional but there's hardly anything out there that adresses this particular situation. You thought? Thanks! This isn't a Rules of Golf question, as the format is not a recognised one, so it totally depends on the Conditions of Competition set down by the Committee. I do not have any experience of the Nassau format, as it is not commonly played in Ireland. The only point that I will make is that in any shot-gun starts that I have played in the back nine is always holes 10-18, wherever players start from. Great stuff to read here, question though.. In strokeplay competition players are also each others marker. In this case a two person flight, one person decides to quit playing during the round without having a valid reason. No doubt about him being disqualified, but does this have any consequences for the player who now is left with a non playing marker. In this case the quiting player stayed to be marker for the player who wanted the finish the round. Is the best way (is this even allowed) to handle this situation? Or should the player have continued playing in the upcoming flight behind him in order to finish his round in stipulated order. What if they were the last flight? Would be nice if you can point me at the good direction here. Our State's director of golf tournaments agreed that using the first nine and last nine as two of the Nassau matches comports with the rules of match play and makes more strategic sense than splitting one of the nine hole matches. What the hidden disadvantage is however that the handicap strokes might not be evenly distributed front and back. USGA guidelines say to avoid setting a stipulated round with lopsided yards, pars and therein, stroke holes. But with a bit of staggering some of the starting holes we can mitigate that. Next time however, we will do everything in our power to have assigned tee times. So, they don't do "reverse shotgun" starts in your part of the world, eh? Thanks again! A player may continue marking the score card of a fellow competitor, even when he discontinues playing; however, he or another person(s) who is retrospectively acceptable to the Committee, must accompany the player on every hole of the round. In the circumstances that a marker cannot finish the round and there is no-one else readily available I am sure that any Committee would retrospectively agree to the player joining a following flight, but there could indeed be an insoluble problem if the player was in last flight of the day, as a score is not valid unless there was a marker present throughout the round. I played in a 36 hole strokeplay competition at my club. I came second losing by a few strokes the winner hadn't marked which card was for first round/second round before putting in box. Should this have been a DQ? No, in my opinion this was the responsibility of the Committee, Rule 33-5. Can I query a matter re Stableford scoring. We have a local society, playing 6/7 times a year and always play Stableford. In a recent meeting, three players have underscored their stableford allowance - ie claiming 2 points when they were entitled to claim 3 on a particular hole whilst another has overscored - ie claiming 2 points when they were only entitled to claim 1 point. In addition three of these haven't signed their cards. Those not signing are disqualified for not doing so but where do the incorrect points stand? Grateful for your thoughts please? The player / marker are only responsible for entering the gross score for each hole. In bogey, par and Stableford competitions, the Committee is responsible for applying the handicap recorded on the score card and determining the result of each hole and the overall result or points total, Rule 33-5. Bit annoyed with my club for disqualifying myself and 2 playing partners at last week’s medal. Turned up before our allotted playing time of 08:40 and as the weather was quite poor decided not to play, although other members went ahead and played, so booked ourselves in to play later at 12:48, turned up then and played game as normal. We have all been disqualified under rule 6-3, we did not sign the register in the morning but did so before play when we returned in the afternoon. My question is was the committee correct to disqualify us? The Committee was acting within the Rules of Golf to disqualify you under Rule 6-3 for starting more than 5 minutes later than the time that was on the time sheet. I am sure that you understand the rationale; players should not be able to choose what time they play at in expectation that course conditions will be more favourable. In my club championship qualifier I need to play with a fellow competitor or a “spotter” from the pro shop. Since I was getting my round in on the last day, a pro shop assistant accompanied me on my round. On the eleventh tee we got behind a group of older gentlemen out for a leisurely Sunday afternoon round. At the same time, thunderstorms were approaching from the west. We (I) decided to play holes 16 , 17 and 18 next where no players were and then play the balance of the holes on the back nine. The assistant said nothing. The next Friday I got a call from the golf chairman that I was disqualified. What do you think? Isn’t this a discretionary rule that the golf committee may waive? A penalty of disqualification may in exceptional individual cases be waived, modified or imposed if the Committee considers such action warranted. Part of Rule 6-1 states that players are responsible for knowing the Rules. Competitors should certainly know that they have to play holes in the stipulated order. In my opinion, the Committee should definitely not make an exception for the circumstance that you describe, as it could result in other players claiming exceptional circumstance for a variety of other Rules breaches. Would like to ask if penalties\disqualifications can be imposed on someone who has not signed the register and decides not to play, for whatever reason, at their allotted time? A player who does not start their round within 5 minutes of their starting time is disqualified, Rule 6-3. There is no requirement in the Rules for players to sign a register before commencing play, but Committees may require players to do so in a Condition of Competition, which includes a sanction on those that fail to do so, such as suspension from the next competition. The circumstance that you describe would be common practice in match play and no penalty is incurred by either side. You conceded one opponent's putt and as the his partner could not better his score for the hole he correctly took that ball out of play, thus saving time. My apologies. When I saw the word "opponent" I started thinking of match play, even though you had said that it was Stableford. Of course, you are correct, holes have to be played out in Stableford, so both the balls had to be replaced and played out if any points were to be scored by them on that hole. The player who knocked his partner's ball out of the way was penalised one stroke for moving his own ball and another stroke for moving his partner's ball, under Rule 18-2a(i). There is no penalty for your partner for incorrectly telling the other player that he could "pick it up". My husband is on the board for a charitable 18 hole tournament. This is the 11th year they have held the tournament and 7th year at the same course. This year, there was one team who arrived at the club house approximately one hour after the rest of the teams had turned in their score cards. This team claimed to have kept track of their score using the GPS on their cart which has an option to track scores and did not have a completed score card. The team was told that since they did not have their score recorded on a score card and the GPS score had been cleared, they were disqualified. In the previous 10 years of the tournament there has never been a team that has not kept score on a score card. All members of this team have played in the tournament at least 3 of the previous 10 years. We have not been able to find this scenario in the USGA rule book. Should this team have been disqualified? Their claimed score would have been the winning score for the tournament. You were absolutely right to disqualify the team under Rule 6-6; they did not return a signed score card to the Committee immediately they had completed their round. Two guys at our club played and were declared winners of a two ball competition at another club,a week later our handicapper reviewing the cards realized one of the players played with the wrong handicap. The organizers are now asking that the team be disqualified.Is there a ruling which dictates how long after a card is deposited a player can be disqualified? If, before the competition closed, either player knew that the handicap on their returned score card was higher than that to which they were entitled, and this affected the number of strokes received, they should be disqualified (Rule 34-1b(ii)), otherwise the result stands. Played in a stroke play match against 2 opponents. My third shot on a par five landed right of the green in an area where it could not be played due to man made objects both blocking my backward and forward swing. I took free relief on my third shot line of flight and ended up bogeying the hole. Later after the round was completed it was discovered that my third shot was actually ob. There was no ob markers on this particular hole and therefore it could not be determined beforehand whether my ball was ob before it was played. What is the penalty that should be incurred by myself? This was a friendly match between friends. There are several points of issue here. There is no such format as a "stroke play match"; you were either playing stroke play, in which case those you were playing with were fellow competitors, or a match, in which case they were opponents. You say it was a "friendly match between friends"; you were either playing golf, in which all the Rules have to be observed, or some other game, where you can agree what to do with the other players in the group. At first you say that there were immovable obstructions blocking your swing path, in which case you were permitted to take relief without penalty from them, as in Rule 24-2, but then you say you took free relief on your "line of flight" which is not permissible under the Rules of golf. Finally, on the out of bounds issue, if you played your ball from out of bounds and did not correct that mistake, you were disqualified in a strokes competition, disqualified from scoring for that hole in a Stableford competition, or you lost the hole if it was a match,. The fact that the out of bounds may not have been correctly marked is unfortunate, but not uncommon. In a stroke play competition you have to play out the hole with two balls, when such uncertainties arise, Rule 3-3. Must say what a helpful site this is. I found it while searching for information on what needs to be included on a scorecard to prevent a dq. My club are disqualifying players for some minor omissions, the 2 that concern me most are failure to mark what tee box was used, and also failure to initial any corrections made by the marker on the scorecard. Its my understanding that a player need only enter their name, handicap and gross scores with 2 signatures. I understand a committee can request players to add other information to help with processing (competition name, date, tee used, total scores, points etx) but failure to do it is not grounds for dq? Neither of the circumstances that you describe are reasons for disqualification under the Rules of Golf. It is the Committee's responsibilty to accurately define the course, which includes the teeing grounds to be used in the competition. Decision 6-6a/6 specifically states that a Committee may not require that alterations made on score cards be initialled. After a Stroke Play Match a player of Handicap 13 handed in his scorecard. On determining the top 3 players of the day the Captain then calculates the Individuals Points. The winner(s) is (are) are declared based on stroke play. The Points are used to determine the number of shots a player would lose (for example, in our social club, if you score 33 or 34 points we cut you one shot on your handicap; for 35 or 36 points it.s 2 shots, etc). For Player A, on his scorecard (which he signed) that was marked by Player B it was calculated that he played 33 points meaning that he'd lose one shot. But on the scorecard of Player C, which he was marking and also recording his own score, he wrongfully added his points to be 32 (15+17) instead of 16+17. When the new handicaps were published he was made aware that his HC is 12. He disputed this and still insisting that he played 32 points. Before the next match started (this time a betterball MatchPlay) he was advised verbally by the Captain that he's a 12 HC, but he refused and continued to play with his partner (of HC +1) with HC13. What should the ruling by the Committee on the matter? First let me point out that that there is no such thing as a stroke play match. Stroke play and match play are different formats of golf with several differences in the Rules. Secondly, your question is mainly to do with handicaps. Unfortunately, unlike the Rules of Golf, which are unified accross the world, handicapping systems vary considerably and I have no expertise in this area. In any case, from what I understand from your question your Society has its own handicapping system. However, if you want an opinion from me, it is that the player must accept the ruling made by the Captain (presumably acting as the Committee) and should be disqualified from the competition for not entering his correct handicap on his card. I think that the Captain would also be justified in imposing an additional sanction on the player, such as not being permitted to enter or play in the next competition. One final point is that it is the Committees responsibilty to calculate the points and the total score, the player and their marker are only responsible for recording the gross score for each hole played. There is no Rule of Golf under which a player can be disqualified for not entering the result of their match on a chart. However, the Committee may have made it a Condition of Competition that players must do so in order to progress to the next round. My blog dated 27th April 2012 is relevant. Fantastic work. I have a query regarding a Rule 6-2b and relevant decisions from R&A that I would appreciate your guidance on. Recently I played in a stableford competition, scoring 37 points. The CSS and result for this competition were not computed and published until 10 days later due to the club secretary being away. I then proceeded to play in another competition 8 days later, under the same handicap. While trying to work out if I should adjust my own handicap I determined that should the CSS be recorded as the SSS for this round then I would be cut 0.3, leaving my handicap at the same level for the purposes of this second competition. Therefore I confidently entered and played off the same handicap which I had played with 8 days previously. The results for both competitions were published in sequence - for the first, I had won and to my surprise the CSS for the day was SSS+1. Therefore my handicap would have been adjusted 0.6, which in my case brought me one stroke lower. When the second result was published, I had won this one also - only to be disqualified for playing with an incorrect handicap. There was no intention to play off an incorrect handicap, and as it happens I would still have won with the 0.6 adjustment - however the local committee feel that unfair as this case is I have still played off an incorrect handicap when it is the player's duty to ensure he does not do so. So, I had made an effort to ensure I did not leave myself open to DQ (by estimating a 0.3 adjustment), played the competition, won it by 2 strokes (medal competition) but was disqualified after the initial result was emailed to competitors as the committee interpret this as a breach on my behalf. We are still investigating the case and are also unsure as to the definition of the competition being determined "closed" which may have a bearing on our interpretation. Do you interpret the decision of disqualification be appropriate and if so can you guide me on how to avoid this in future? It would seem that one would need to always guess the CSS to be +3 and adjust my handicap accordingly if I enter a competition before the result of a previous competition has been published by the committee. Thanks for your reply Barry and for pointing out this wording in rule 33-7. I agree and feel that the rules of golf are there to make things fair to all players, not to catch people out on technicalities they have no way of mitigating against! This is not a Rules of Golf question. If the specific Conditions of Competition do not address this matter you will have to go to the Committee and ask them to make a ruling. hi Barry we have our closed club championship coming up and we have a player who is a full member of our club and a full member of another club and the other club is down as his home club as he can only have one golf link number. Can this player play in our closed club championship and win anything. Your question depends on the Conditions of Competition for the closed club championship. However, in my opinion, if the matter is not covered in the Conditions of Competition, the player should definitely be permitted to enter, as they are a full member of the Club. If any part of your ball was touching, or even overhanging, the course it was in bounds, ie. part of it was on the course side of the line. The length of the grass is not relevant, it is the line that defines out of bounds. My blog dated, Friday, 15 February 2013 shows a diagram explaining this concept. In a recent club monthly medal, I played in dreadful weather conditions. My score card was signed by myself and my playing partner, and was, at that stage perfectly legible. It was then placed in a box along with all of the other cards from that day. I played the round of my life, and scored a new 64. Thinking I might well be "there or thereabouts" I checked masterscoreboard a few days later, and discovered that the winner had returned a net 66. I then checked, and saw that my name was at the very bottom of the list of competitors, marked "no score returned". I made enquiries, and learned that the person who collated ll the scores claimed that the score on my last three holes was illegible. Was he right to do so, without contacting either me or my playing partner? I had recorded my score on my partner's card, although I am unsure if that could have been used to confirm my score. I sympathise with you, but if the score for any hole could not be read on your score card the Committee obviously cannot guess what it should be. From my experience on Committees I know that if an exception for one competitor is ever made it will forever be brought up when other situations arise; so Committees have to apply the Rules strictly and without favour. For your future information, Decision 6-6a/7 confirms that if an original score card is lost or is illegible, due to wet weather, a different score card containing the competitor's name and scores, and signed by both the player and their marker, should be accepted by the Committee. Mat I start by saying how impressed I am at the speed with which you responded to my query. I am disappointed at the content, but hey ho, worse things happen at sea. I will advise the committee about the decision that a fresh card, properly completed, should have been accepted, and see what they say. An excellent resource for all us club golfers by the way. If I duff my tee-shot shot and it lands just outside the teeing area can I take my second shot from there or do I have to return to the tee and take the shot again with one stroke penalty? You may take your second stroke from where the ball came to rest on the tee box, unless there is a Local Rule that makes it mandatory to take relief from the tee box, which is unusual and in my opinion totally unnecessary. In the third round of a summer knock out which displayed a restricted handicap condition, player A claimed two many shots which went unnoticed by her opponent, player B. Player A won and player B posted the result on the ladder. Another member complimented player A on managing a win against such a formidable opponent at which point Player A realised her mistake, contacted the Ladies' Secretary and offered to withdraw from the next round. The Secretary confirmed that under Rule 6-2a Player A was DQ'd, changed the result on the sheet to Player B and reported the circumstances at the next Committee Meeting. Was this action incorrect because a result had been posted or was a DQ appropriate when the Competition was "in progress". Unless player A knew she was giving wrong information for the restricted handicap competition, the result of the match between A & B should stand, Rule 2-5 and Decision 6-2a/5. If A did withdraw from the next round the player that she was drawn against would receive a walkover, B should not be reinstated as the result had been posted before any claim was made. I've recently played in a match play semi final. My opponent and I agreed to play at 3 o'clock on a certain day. (this was just a private agreement, not a committee). He didn't arrive until 4. I went on to lose, could i have claimed the match with him being late. You certainly could have claimed the match when your opponent had not arrived on the 1st tee by 3.05 pm, Rule 6-3. There is an exception to this Rule if the Committee determines that exceptional circumstances have prevented a player from starting on time, but the Decisions show that it has to be something very serious, like saving someone's life! Mate sorry. Pretty urgent but I need to ask you about a ruling. Club Championships over 3 rounds of stroke play. Then converts to matchplay where a semi final is played then a final. A player was ineligible to compete in the tournament. He played the first 3 rounds of stroke play. Then he made the top 4 to advance to the semi finals of matchplay (which he won his first match). It was then found out after that match that he should not have competed at all in the tournament at all. What are you thoughts please? This is really a question for the Committee, but I will offer my opinion. If the Committee made an error in permitting the player to enter the competition then I think the results should stand. However, if the player knew that they did not meet the conditions for entry then they should not be permitted to play the semi-final and the next qualifier should take their place. You are correct, disqualification under Rule 11-1 only applies to a player that makes a stroke with a non-conforming tee, or at a ball teed in a manner not permitted by this Rule. Your breach was under Rule 11-4, which in a Stableford competition disqualifies you only for the hole and not from the competition, Rule 32-2. Can you please explain the rule listed as 26 above. I seem to be a bit confused on the interpretation. Thanks. Did you check Decision 11-2/2(b) that I referenced in the blog? The Decisions book can be viewed on-line if your Club/Society does not have one. The Definition states that tee-markers, the outside limits of which define the teeing ground where players must start the hole from, are initially fixed. Obviously, it can have a significant effect on the competition if a player moves one or both of them, so doing so incurs the penalty of disqualification, unless the tee-marker is replaced before the player or any other player plays from the teeing ground, in which case the penalty is modified to loss of hole in match play or two strokes in stroke play. I recently competed in a 2 round club competition, leading after round 1 and my handicap being cut by 1 stroke. After round 2, I lost the competition on countback, but the club failed to add the scores up correctly and wrongly didn't reduce my handicap by one and published the results as me winning, even though I signed for the correct score off my reduced handicap. As a result, the 2nd placed player complained and the committee pulled out all the scorecards to check their mistake. As I had signed for the right score, there was no problem with my score, but it then turned out that the other player who was now deemed the winner failed to sign his card for round one. The club are saying that because they had closed off the competition and not checked his card was signed, the result stands and I finish 2nd! I am not happy and am complaining that under the rules of golf, he should be DQd for failure to sign his card, regardless. Am I or the club correct here? In the circumstances that you describe, the other player should have been disqualified after round one for not recording a handicap on his card. However, the Committee is correct in that, as the competition had closed before the error was detected and none of the exceptions to Rule 34-1b apply, the result must stand. However, in similar cases I am aware that the Committee, having made a mistake, made sure that the player who lost out through their incompetence was presented with a prize of equal value as wrongly given to the other player and an apology. What would happen if you are playing match play , and the person you play against hits their ball in the trees, so you go look for the ball, can’t find it but suddenly this person drops an identical ball and claims they found it, but then you go and find this persons original ball? I would ask the player to immediately disqualify them self from the competition for cheating. If they insisted on completing their round and you were their marker, you should obviously not sign their score card at the end of the round. In any case you should report the facts to the Committee, who should disqualify the player and hopefully sanction them, by banning them from any competitions for a period of time.